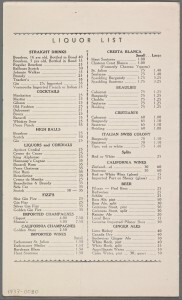 In reading many early restaurant menus on the New York Public Library’s invaluable online archive, I was struck by the continual mention of California wine. It appears on most menus, regardless of type or class. 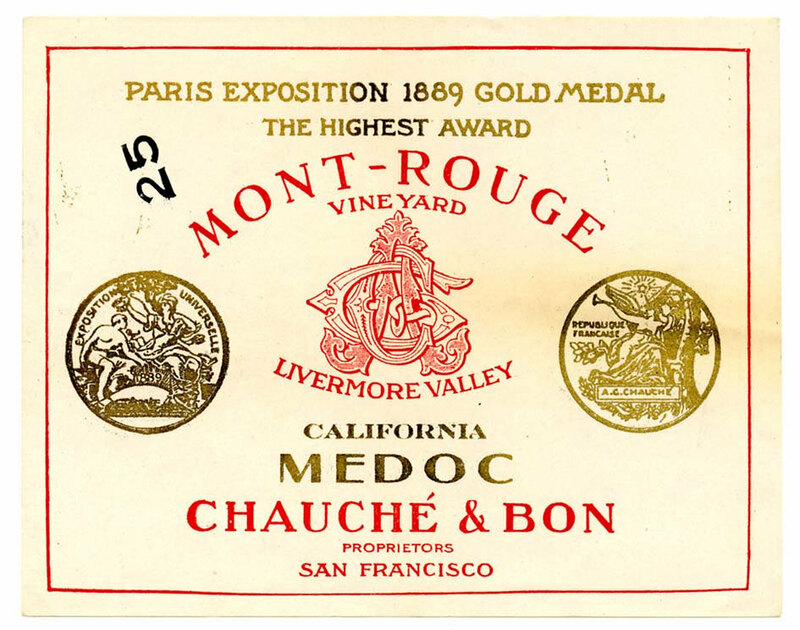 To be sure, until the 1970’s and later, imported wines tended to dominate, but California and sometimes other American wines were rarely ignored, and occasionally given marquee billing. One might expect that a restaurant in the Bay Area, close that is to the storied vineyards of Northern California, would always have proudly featured local wines. Alas, this was not the rule. As was typical almost everywhere except France and some other places, the assumption was that imported was superior. From cheese to wine to olive oil and much more, this has been a longstanding feature of the retail culinary world. Only recently have locavore and market trends partly reversed this old way of thinking. To be sure, all food and drink were local originally – Mayes itself was founded in a market, in 1867 on California Street (the earthquake forced a relocation to Polk Street). But by the mid-20th century, it was a sign of prestige for an ambitious restaurant to offer the best from afar, literally if it could and via other influence on the menu. This is why the Mayes menu of the 30’s is so interesting: it continued to offer a mainly “market” cuisine, showing confidence in its original mission. While the Mayes list leads off with a few French wines, almost four times as many California wines were offered. Some names resonate to this day including of course Beaulieu Vineyard, and Cresta Blanca which is now part of Wente. Cristiani, is, I believe, the ancestor of the highly regarded Buonocristiani of Napa – at any rate in the 1930’s, the Cristiani family, originally from Tuscany, were producing wine in the Bay Area and also were wholesale wine suppliers. Note that many styles popular today were available to guests of Mayes in 1937. These included “Riesling” and “Cabarnet”. The use of varietal names suggests that the grape types may have actually been grown. The Chablis and Burgundy mentioned may have issued from Chardonnay and Pinot Noir grapes, or perhaps not. Petite Syrah was a major variety grown in Napa in the 1930’s, so possibly that accounted for the “Cabarnet” (thus intentionally misspelled?). At a minimum, an attempt was being made to offer credible local examples of famous foreign specialties. I’d think a high standard was often reached, since the best of California viticulture had reached international attention well before the Volstead Act. What can one make of the generic category “California wines”, since Beaulieu, Cresta Blanca, Italian-Swiss Colony and Cristiani were obviously also Californian? I think the menu was saying that these other wines came from elsewhere in the State than Sonoma and Napa. 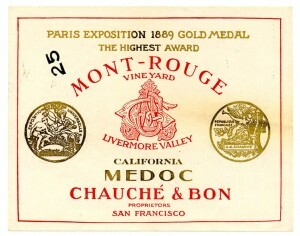 After Prohibition ended in 1933, winemaking quickly was re-established throughout California. The Sierra Foothills have grown Zinfandel since the early 1800’s, maybe Mayes’ “California” Zin was from there. Or maybe it was from the Cucamonga Valley in the south which was acquiring a reputation for small-producer Zin even in the 1930’s. “Sauterne” is mentioned both as a “generic” and under each listed winery name. I’d guess the south or central region was making its version of the honeyed French classic from the Graves in Bordeaux. The named wineries’ Sauterne cost a lot more than the generic one, which probably says a lot. While the named wines are rather less costly than the French ones, two of Cresta Blanca’s wines cost more than any of the still French wines. The kind of detail and connoisseurship that went into confecting a locavore wine list of this type, a mere four years after Repeal, is impressive and telling. And what a food selection Mayes offered, too. The seafoods covered the region, up to Alaska, in detail but stretched to the East Coast for a few supplies. Toke Point Oysters sounds daring as a name, not a little modern, but I think “Toke Point” is a genuine place name, the West Coast context notwithstanding. Note the 25 salads offered – in 1937. A sprinkling of Italianate dishes suggests some cosmopolitan influence but overall the feel is all-American and suggestive of a liberal use of fresh and local resources. The menu has a modern ring and only occasionally betrays its period origin – the eggplant and bacon dish shows this, and scrambled brains. (Then too they say bacon goes with everything). The basic building blocks of the menu are regional fish and seafood in numerous but straightforward applications, endless salads, a variety of cooked and grilled meats, fresh vegetables served with butter or otherwise simply, wines of the country, and a few simple desserts. This is the foundational approach of modern cuisine. The French classical kitchen, which had influenced the higher reaches of Anglo-American dining until about World War One, was quickly receding as an international force. Elizabeth David would draw similar conclusions based on her experiences in the Near and Middle Easts in the 1940’s. The American kitchen always had a nativist and independent side, but it was coming to early maturity in the form of this Mayes menu of the Roosevelt era. I’ve become inured to finding that restaurants with a vibrant and storied existence 70, 100 or even 40 years ago have generally expired, usually long ago. It was thus startling to find Mayes Oyster House happily pursuing its good work on Polk Street. Except for the Tadich Grill, it is the oldest continuously operating restaurant in San Francisco. Some things have changed, a nighttime club and bar scene now complements the daytime vocation of classic seafood eatery. I heard there’s a burger bar in there, too, but it all works. In typical insouciant West Coast fashion, the website doesn’t mention the venerable history. It doesn’t, but I will. You go, Mayes, for doing the regional thing from the beginning. I’m sure your California wine list is still impressive and even though that space is shared now with many others, that’s okay, as an innovator a special glory is all your own. **Note re Source of Images: The first image above is believed in the public domain, the source is the New York Public Library (www.nypl.org), specifically here. 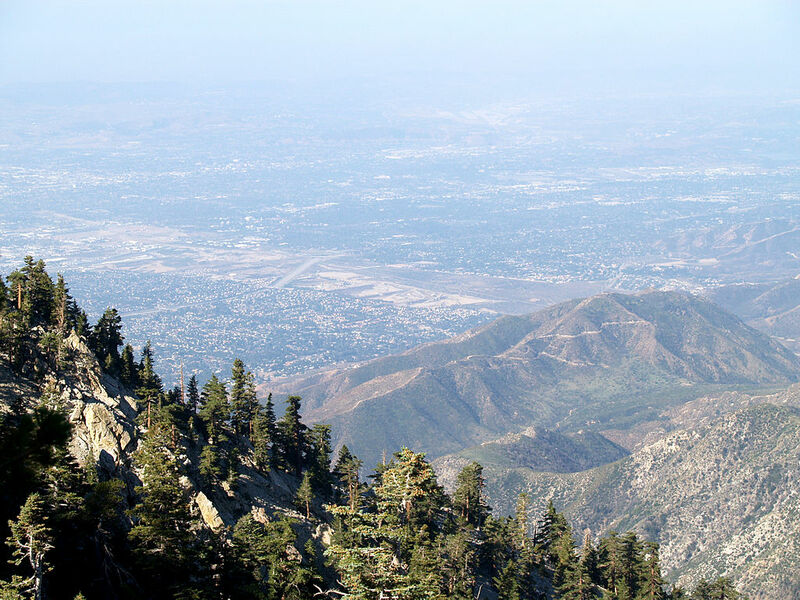 The Cucamonga Valley image shown is entitled “View of Cucamonga Valley AVA from Cucamonga Peak” by Mitch Barrie – Flickr: Valley view. Licensed under CC BY-SA 2.0 via Wikimedia Commons . The URL for the source of the image is here. The third image is believed in the public domain and the source is here.